1. William (?) Turner. According to the 1854 book of the life of his great-grandson James, the earliest known Turner "was for a considerable time an important servant" of the Earl of Eglinton. It is presumed that this was Alexander Montgomerie the 9th earl (1660-1729), as our Turner ancestor would have been born about 1680-90. The earl's seat was at Irvine in Ayrshire. 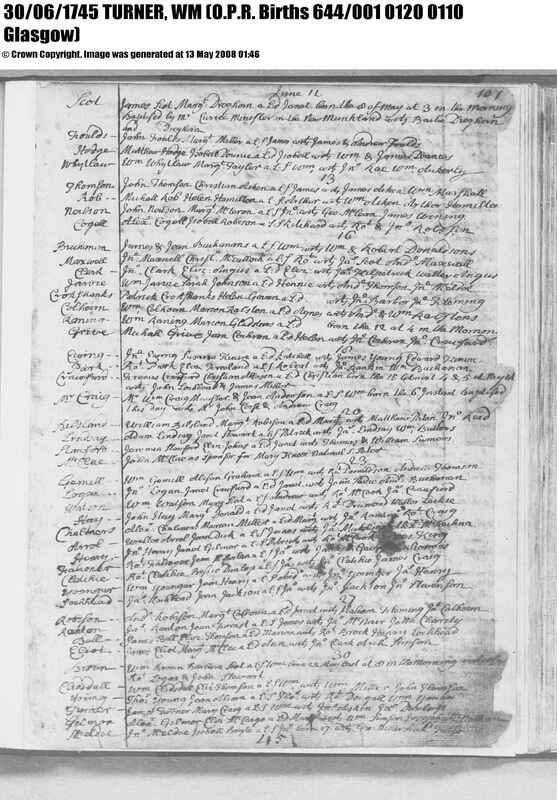 William Turner of Irvine had a son James who was christened August 1, 1711. The above book continues that our ancestor "was removed to Eaglesham to take charge of some property belonging to the Earl of Eglinton in that quarter. He discharged the duties of under-factor, and was much esteemed among all classes. Eaglesham is near Glasgow. From another christening record we learn that the wife of William Turner was Janet Robinson. 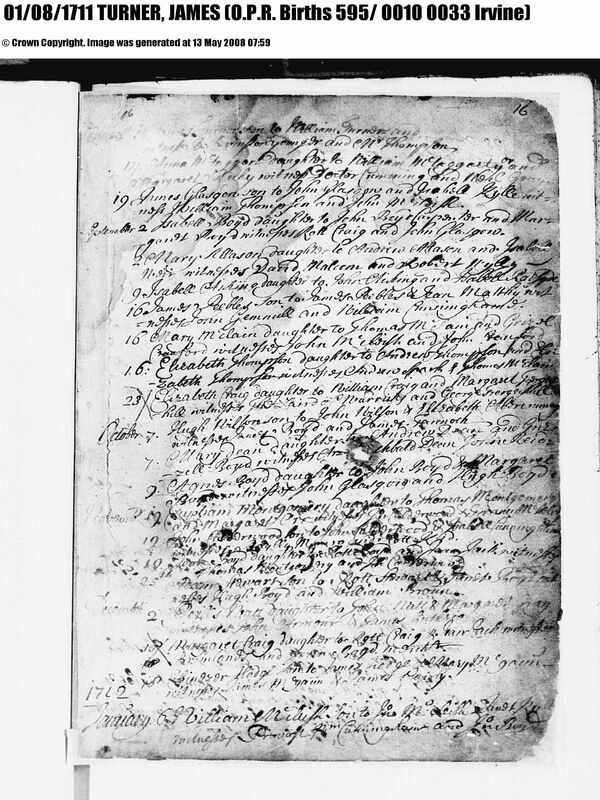 Their other children christened at Irvine were Alexander Sep 21, 1712, Susanna Jan 12, 1714, and Margarat Sep 4, 1715. 2. James Turner, according to the 1854 book of the life of his grandson James, "was brought to Glasgow when he was comparatively young, and was taught the trade of a house carpenter." James married Mary Craig with whom he had "a large family numbering twelve." "He died early, and left his family in comparatively destitute circumstances." 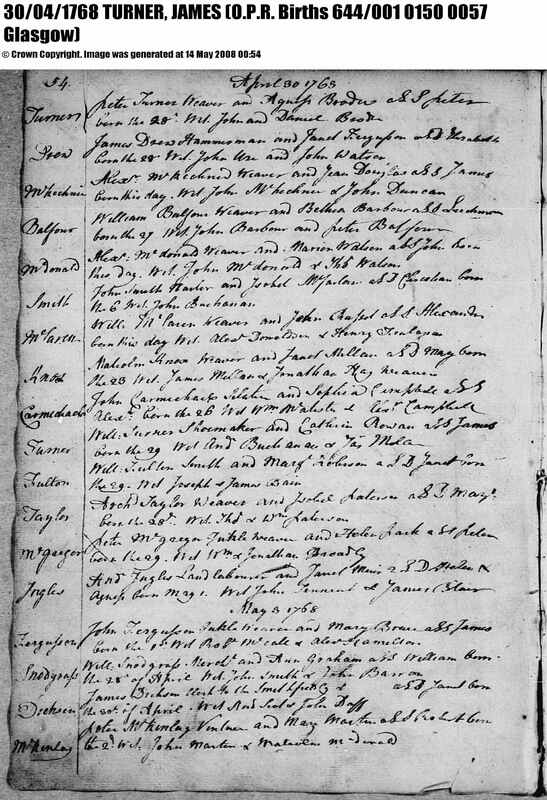 The following 8 christenings for the children of James Turner and Mary Craig in Glasgow have been found: Janet May 27, 1739, Anne November 18, 1740, Mary Aug 5, 1742, William June 30, 1745, James July 20, 1749, George Feb 3, 1751, Janet July 28, 1753, James April 11, 1755. Other researchers also give Alice Feb 13, 1748 and Barbara Mar 18, 1752. James Turner was enabled to go into business on his own with some money inherited by his wife. The marriage would have been ca 1738 but no record has been found. Mary Craig, daughter of Andrew Craig and Mary Clark of Glasgow, was christened January 1, 1716. If this was our Mary she would have been about 22 when she married. 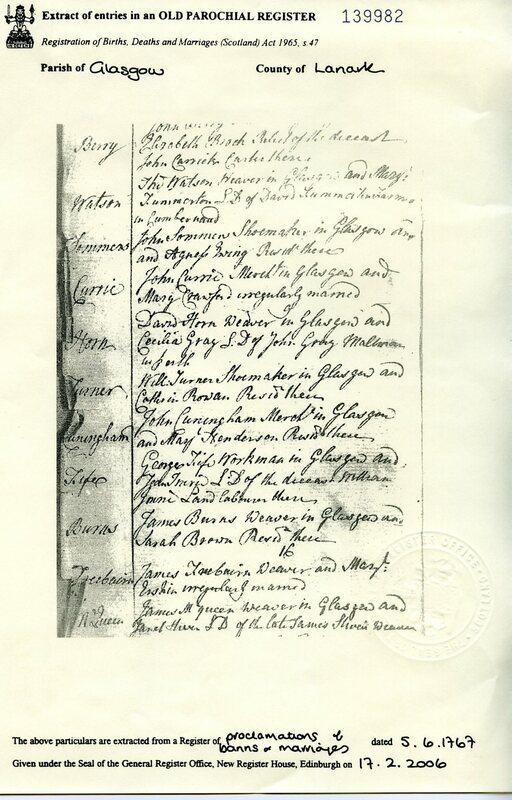 Mary Craig, daughter of John Craig and Isobel Reid of Glasgow, was christened May 29, 1720. If this was our Mary she would have been about 18 when she married. 3. 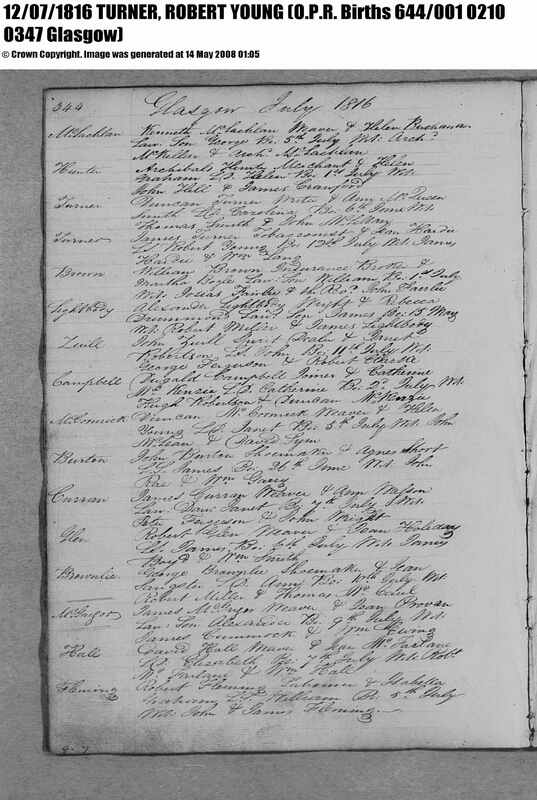 William Turner shoemaker in Glasgow and Cathrin Rowan(d) resident there were married in Glasgow June 5, 1767. Their children were James born April 29, 1768, Fergus (Jan 1771), Sarah (July 2, 1773), Jean (Sep 12, 1776), Mary (Oct 17, 1779), and William (May 11, 1784). 4. James Turner, tobacco spinner of Glasgow, was married there by Alexander Ranken, minister, to Jean Hardie on June 27, 1797. (Two Jean Hardies were christened in Glasgow -Dec 14, 1765 and Sep 26, 1775). Their children were Alexander (chr March 1, 1800), George (chr October 8, 1801), Alexander (chr March 8, 1803), William (chr February 4, 1805), Agnes (chr October 24, 1806), James (chr October 19, 1808), Mary (chr September 26, 1813), Robert Young (chr July 12, 1816), Thomas (chr July 31, 1819). George Turner, merchant, is mentioned in records as eldest son of James Turner, merchant, 23 May, 1828. 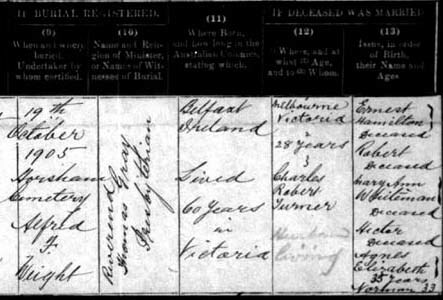 William Turner, merchant, hardware merchant, is listed as younger son of James Turner, merchant, 15 June, 1842. James Turner died May 20, 1858 at the age of 90 and was buried at the High Church burying ground in Glasgow. Only three of his eleven children outlived him, according to the 1854 book of his life. His wife died in January, 1837. His will was probated July 13, 1858. The will, dated 11 November, 1841 describes his considerable property in and around Glasgow. He is described as a resident of Thrushgrove and a former tobacconist in Glasgow. He provided for his sister, Sarah Turner, and gave a gold watch to his son James and six silver spoons to his son Robert Young. He makes provision for Agnes Bruce, wife of his son Alexander, and their son James. He makes no allowance for this Alexander, stating that he has already invested and lost considerably in him. (An 1849 codicil notes that Alexander is deceased.) The rest of the estate was to be shared equally amongst the remaining sons, George, a stationer in Glasgow, William, a hardware merchant in Glasgow, James (listed in a 1852 codicil as now returned to Glasgow), Robert Young, and John Stewart (noted in 1852 as being resident out of Scotland). It is interesting to note that the death of Robert Young Turner in 1849 (see below) is not mentioned in the 1852 codicil. Perhaps the news had not yet reached Glasgow. 5. Robert Turner merchant in Glasgow and Mary Hogg residing there late daughter of the deceased Graham Hogg late clothier there (were) married 22 January (1839) by Mr John Peden Burgher Minister in Glasgow. 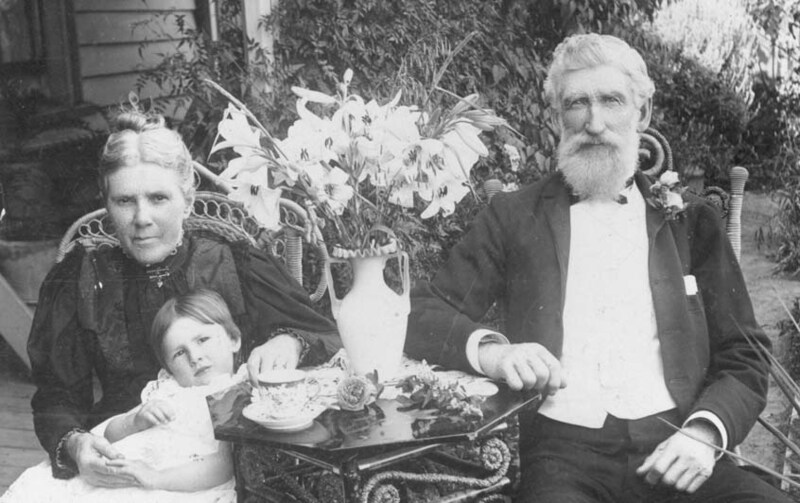 Robert and Mary Turner migrated to Australia after their wedding and settled in Launceston, Tasmania. Their children were Charles Robertson, born September 22, 1839, May (Jeanne Hardie? ), born January 2, 1841, James, born December 15,1842, Elizabeth Hardy, born May 10, 1845, and Agnes Scott, born March 3,1847. Robert Young Turner died of consumption at the age of 32 on February 19,1849 in Westbury, Tasmania. His profession was given as innkeeper. The informant was his ten year old son, Charles. 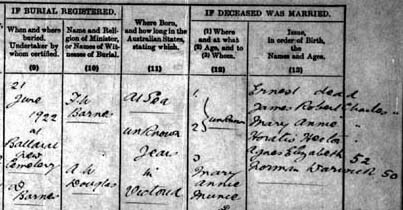 On November 22,1850 Mary Turner remarried James Crear Shearer and had Mary Jemima in 1851, Gilbert Graham in 1853 (d 1854) and another daughter in 1858. She died of influenza on August 11, 1860. 6. 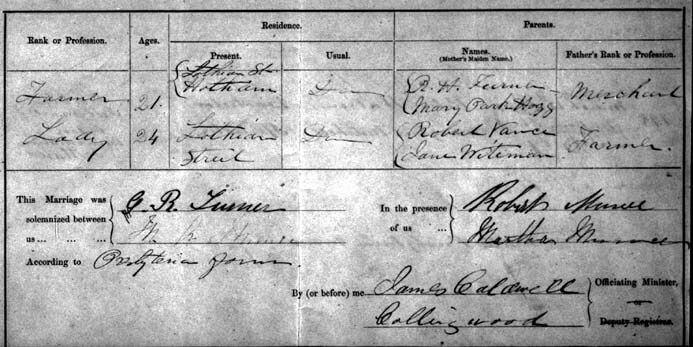 Charles Robert Turner was born at sea in 1839/40, a son of R H Turner, merchant, and Mary Park Hogg, according to his 1861 marriage certificate. His birth was recorded in Launceston as September 22, 1839 but it is possible the event occurred before the ship's arrival there. The registration was dated October 15 so quite possibly the family arrived in Launceston during the previous three weeks. No record of their arrival has been found. He married January 30, 1861, Mary Anne Munce. Both were listed as residing in Lothian St, Hotham (North Melbourne.) It is reasonable to assume that Charles Turner knew Mary Anne Munce in Launceston and that he moved to Melbourne at or around the same time that Robert Munce brought his family there in 1859. 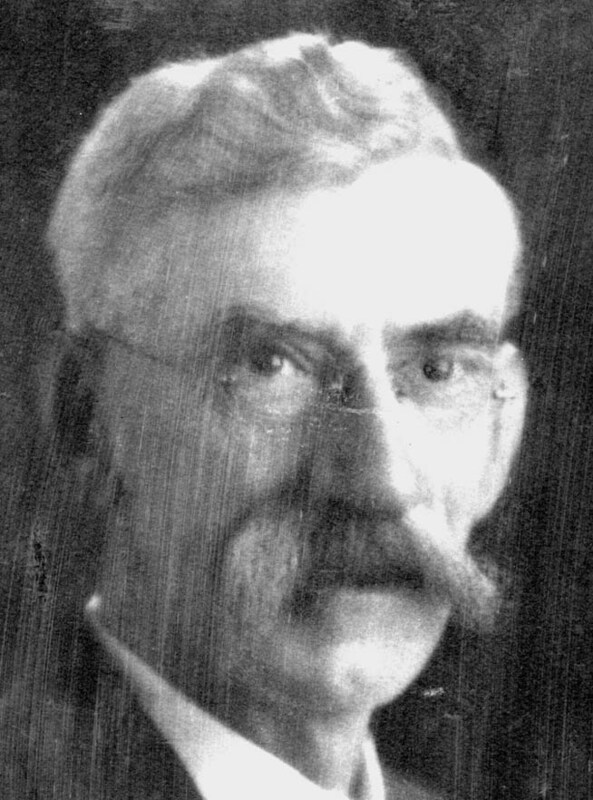 Their children were Ernest Hamilton (28 Sep,1862 - 25 Oct, 1893), James Robert Charles (7 Oct, 1863) and Mary Ann Whiteman (18 Sep, 1865) who both died of Diptheria in 1867, Horatio Hector (1868), Agnes Elizabeth (1870), and Norman Warwick (1872). According to their grand-daughter "Granma Turner was aristocratic in breeding and upbringing." "Granpa Turner was too aristocratic, used to everything and trained for nothing - just a gentleman." It is interesting to note that he would have received some portion of his father's share of his grandfather's estate after 1858, perhaps in regular payments from the trustees in Glasgow. Marianne Turner died 18 October, 1905 in Horsham, Victoria. 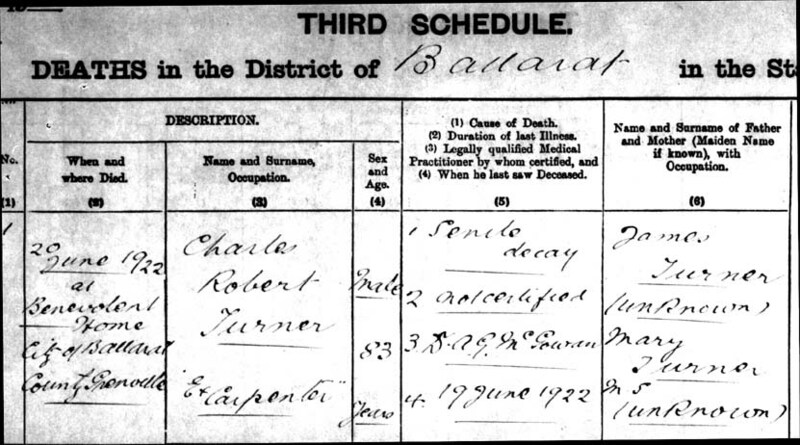 Charles Turner died 20 June 1922 in Ballarat, Victoria. It is interesting to note that the certificate gives the father's name as James - in fact his grandfather, and the source of his income via that estate. 7. Norman Warwick Turner was born 13 May, 1872 in Glenorchy, Victoria. He married Lydia Sophie Bretag on 19 April, 1897 at Horsham, Victoria. Their only surviving child (twins died at birth) was Marianne Sophie (1898). At that time Norman gave his occupation as hair dresser. He was also a fine woodworker. His daughter wrote"My father left school at 11 and he and elder brother Ernest kept their mother and father and sister, and then in his twenties Ernest died in a minute at work of a heart attack. From then on my father was the sole family support. He cared for and buried his mother - kept his father, boarded him at "The White Hart" and he came to us every Saturday morning for pocket money. Later dad put him in a home at Ballarat and kept and buried him. .... He was so straight and honest but never forgave anyone if they disappointed him. He was hard but a fine and wonderful son ... I was scared of him ...he took me riding and shooting but I could only go with him and allowed no freedom. But never denied anything else I wanted." Norman Turner died 12 April, 1939 in Melbourne. 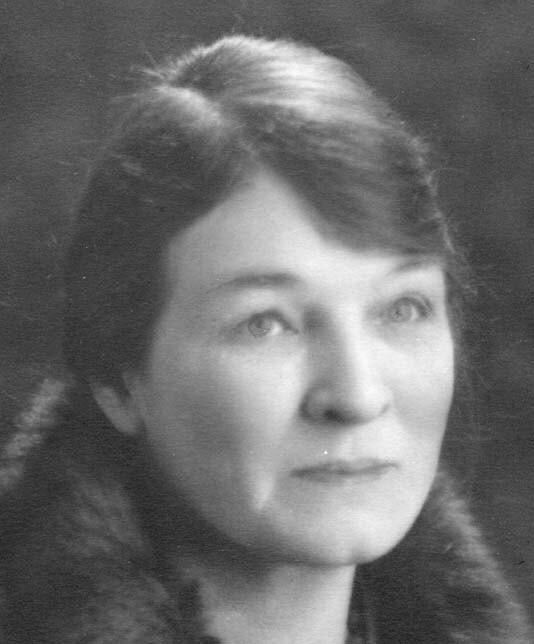 Lydia Turner died 22 December, 1959 in Melbourne. 8. Marianne Sophie Turner was born January 20, 1898 in Horsham, Victoria (seen above with her grandparents) where she grew up. 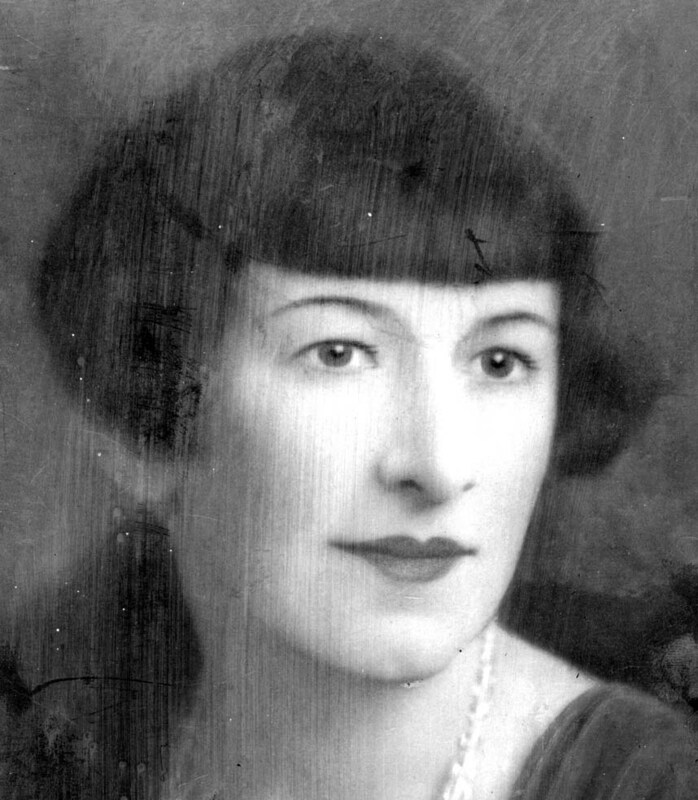 She married George Henry Wion, April 17, 1930 in Melbourne, Australia.